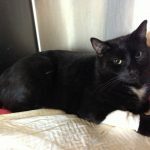 The adoption fee for all our foster pets includes microchipping, desexing, first vaccination and flea and worming, lifetime registration, heart worm testing for dogs and FIV testing for cats if this has been done. Full sponsorship $40 per month. Half sponsorship $20 per month. Clementine and her day-old kittens were rescued from death row. 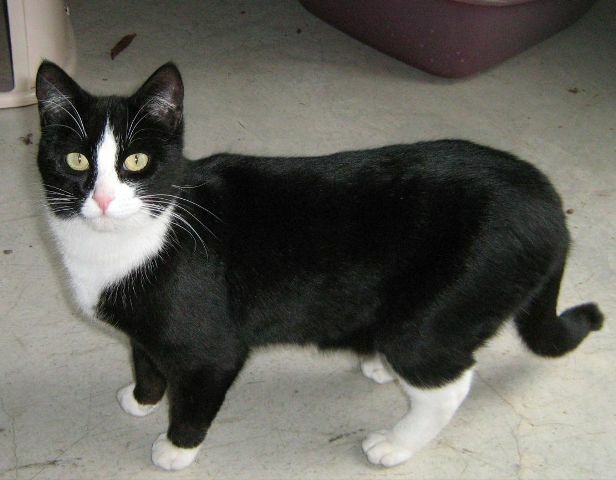 Clementine (F) is a slender and elegant black and white cat. She has a lovely black coat (chocolate-brown in the sunlight), with a white blaze, bib, stomach and front paws, and enormous yellow-green eyes. Clementine is a gentle and friendly young cat with a quirky little personality, who likes company and a little space to explore. She was very thin when rescued but has since put on a little weight and is in good health. She has been a fastidious mother and plays lovely chasing and wrestling games with the kittens. 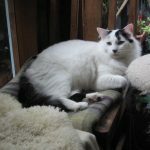 Clementine is sociable with the other foster cats and very relaxed with human visitors, and is looking forward to her own special and loving home. 10/11/10 – Clementine has been tested and is FIV negative. Dash (M) is a short-haired black and white boy.He was rescued with his mum Clementine from Death Row with his brother Indigo who has been adopted. Clementine and her kitten Dash have similar personalities. They walk lightly on this planet. Both are rather shy with people (Dash more so than his mother) so if you are planning to adopt one or both of them, you will have to be patient to gain their confidence. Being gentle is the key to gain their hearts. Once they warm to you, they are very engaging and gentle. If they are not both adopted by the same person, they will probably do best as the only pet in the household.